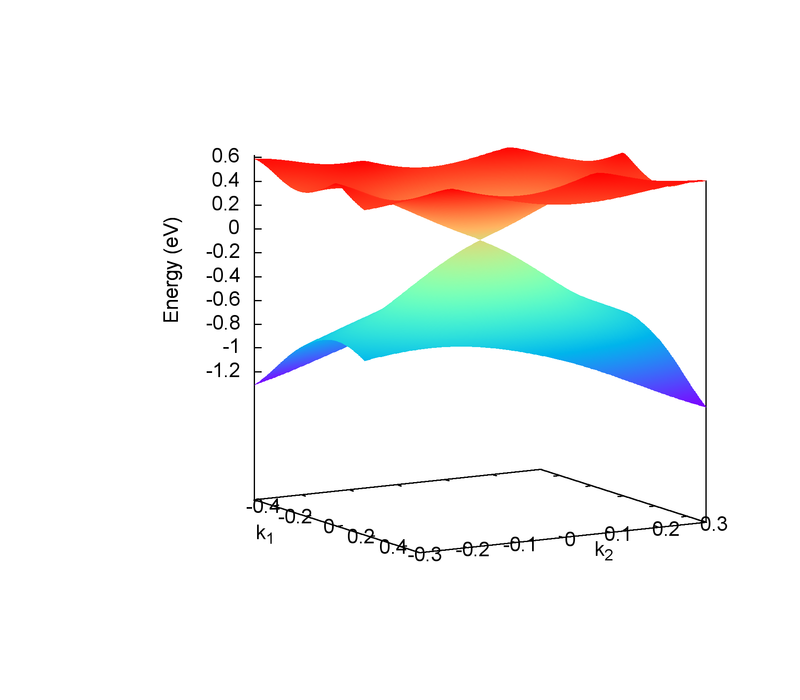 You can calculate the energy bands with the given k points in the KPOINTS_3D KPOINTS_3D card. Typical flags for this mode in the wt.in. Calculate bulk energy band for a series k lines. This is the basic calculation after the construction of Wannier functions. You have to compare your Wannier interpolated bands with the DFT bands. Those two bands should match well around the Fermi level. Typical flags for bulk band calculation in the wt.in. From the 3rd to the n’th column are the projected weight of the wave function at each k point and each band onto each wannier orbitals. Those weights are normalized to 255 for the color plot convinence. The subrotine for this feature is ek_bulk.f90 . 0.00  0.00  0.30   ! Middle point for a k slice(plane) in 3D BZ. Usually, the position of Dirac points. The bulkek_plane-matlab.dat is in MATLAB data format. You can plot the Dirac cone with matlab. Column 1-3rd are k points in cartesian coordinates. Column 4-6th are k points in a rotated cartesian coordinates where the x and y direction are line in the k plane and the z direction is perpendicular to the k plane you specified. Column 7-10th are energies at each k point. Here we only print out 4 energy bands around the fermilevel. It depends on NumOccupied. Usually, I choose column 4th and 5th as k coordinates and choose 8 and 9 as energy bands to show the Dirac cone shown below. By the way, Bulk band and BulkFS calculations were already implemented in Wannier90 code. The outputs for this function are fs.gnu, fs.png. Calculate the energy gap for the k points in the KPLANE_BULK. This is useful to show Weyl points and nodal line structure. Column 5-12 are the energy value for valence and conduction bands close to the Fermi level. There are 4 conduction bands and 4 valence bands. This helps us to find Weyl points and nodal line structure in the 3D BZ. Column 5-6 are the energy value for valence and conduction bands close to the Fermi level. There are 4 conduction bands and 4 valence bands. Column 7-9 are the Direct coordinates of the k points. Please don’t set Nk1, Nk2, Nk3 too large. Otherwise, it will become very time consuming. Usually, 15*15*15 is enough to get converged number of Weyl/Dirac points. You will find that there are 8 Weyl points in the BZ as expected. After you identify the positions of Weyl points, you could use this function to calculate the chirality, which tells you whether a Weyl point is a sink or a source of the Berry Curvature. The first line shows the chiralities of each Weyl point. The first column is k point. From the 2nd to the last column show the Wannier charge center phase. In total, there are Num_weyls columns. Before using iterative green’s function to get the surface state spectrum for semi-infinite system. We also can just construct a finite thickness slab system and calculate the band structure for it. The 2nd column are energy values. The 3rd column represent the surface weight, which is normalized to 255. Band calculation for wire system. Only one direction is periodic, the other two directions are confined. You don’t have to set the k path, because it only has one direction. 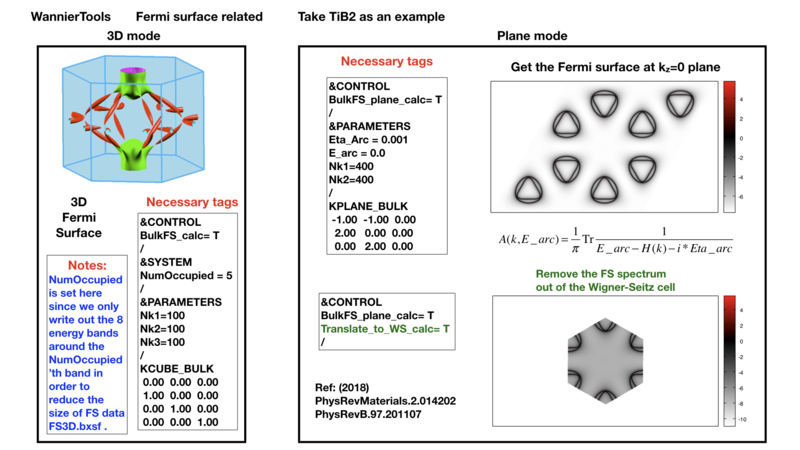 One important feature for topological materials is the surface state. The bulk-edge correspondence tells us, if the topological property of the bulk system is nontrivial, then there will be nontrivial states on the surface. Nowadays, there are several method to detect the surface states. One direct way is the angle resolved photoemission spectroscopy (ARPES). Such spectrum can be obtained by the iterative Green’s function. _l and _r means the top and bottom surface. arc.dat_l, arc.dat_r, arc_l.gnu, arc_r.gnu, arc_l_only.gnu, arc_l_only.gnu, arc.jdat_l, arc.jdat_r, arc.jsdat_l, arc.jsdat_r, arc_l_jdos.gnu, arc_l_jsdos.gnu, arc_r_jdos.gnu, arc_r_jsdos.gnu. The gnu script with ‘only’ means we only plot the spectrum with the surface contribution, exclude the bulk contribution. jdat_l is the QPI data without consideration of spin scattering. jsdat_l is the QPI data in consideration of spin scattering. Surface state spectrum at fixed energy level E_arc set in NAMELISTS PARAMETERS . Set SlabArc_calc=T, and set Nk1, Nk2, in NAMELISTS PARAMETERS, set k plane in KPLANE_SLAB CARD. Get the plots with “gnuplot arc_l.gnu”, “gnuplot arc_r.gnu”. _l and _r means the top and bottom surface. Spin texture calculation at fixed energy level E_arc set in NAMELISTS PARAMETERS . Set Slabspintexture_calc=T, and set Nk1, Nk2, in NAMELISTS PARAMETERS, set k plane in KPLANE_SLAB CARD. Get the plots with “gnuplot spintext_l.gnu”, “gnuplot spintext_r.gnu”. Calculate Berry phase of a closed k path in 3D BZ. This is useful in a nodal line system. It is demonstrated that the Berry phase around a closed mirror symmetric k loop is either 0 or pi for a mirror protect nodal line system. In WannierTools, you can specify a k path by a serials k points. Here we take the WC example, which has two nodal lines around K point. The value of Berry phase can be found in the WT.out. 1. In principlely, the Berry phase for around a nodal line should be interger. However, the MLWF-TB model usally is not symmetric. So the value of Berry phase is close to zero or one. The first and the last kpoints in the KPATH_BERRY should be the same to form a loop. Calculate Berry curvature at a fixed k plane in 3D BZ. Set BerryCurvature_calc=T, and set Nk1, Nk2, in NAMELISTS PARAMETERS, set k plane in KPLANE_BULK CARD. Get the plot with “gnuplot Berrycurvature.gnu”. please set NumOccpuied correctly. It represents the “occpuied” wannier bands, not the total number of electrons. In this application, the Berrycurvature is the summation over NumOccupied bands. Not well tested.. Use it carefully. Calculate AHC in the energy range [OmegaMin, OmegaMax]. AHC is in unit of (Ohm*cm)^-1. 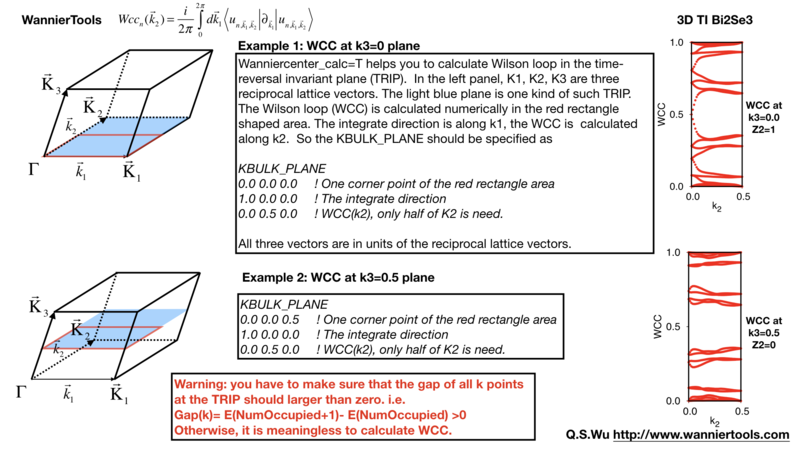 Wannier charge center, which is sometimes called Wilson loop can be calculated by set WannierCenter_calc=T and set KPLANE_BULK CARD, set number of k points for two vectors is Nk1, Nk2 in NAMELISTS PARAMETERS. Notice: You should notice that the first vector in KPLANE_BULK CARD is the integration direction, this vector should be equal to one primitive reciprocal lattice vector. If you want to calculate the Z2 number, Please set the second vector to be half of the reciprocal lattice vector. You can get the Wannier charge center along the second k line. See more details In the paper written by Alexey. Soluyanov (2011). If you want to calculate the Chern number, Please set the second vector to be one primitive reciprocal lattice vector. Important: please set NumOccpuied correctly. It represents the “occpuied” wannier bands, not the total number of electrons. In this application, the Wilson loop is the trace of NumOccupied bands. If you want to study the topology between the 8th and the 9th band, then set NumOccupied=8. The second column is the position of the largest gap of WCC. It is used for drawing a line to calculate the Z2 number (see A. Soluyanov 2011), From the fourth column to the last column, they are wcc for the occupied bands specified with “NumOccupied”. The third line is the summation of the WCC over all the “occupied” bands. It’s usefull for telling the Chern number. For 2D materials stacked along z direction, you could think it as a 3D material with weak coupling along z direction. You can use this function to get the Z2 value at k3=0 plane to characterize the topology. Use “gnuplot wcc.gnu” to get “wcc.eps” plot. At present, We can only calculate mirror Chern number for the simplest case (1. There is only one atom per atom’s type in the unit cell e.g. ZrTe. 2. kz=0 is the mirror plane we concern). For the more complex case, you can modify the source code by setting the mirror operator properly. Define your own mirror operator based on the atomic like Wannier functions in the symmetry.f90 and change the subroutine wanniercenter_mirror in wanniercenter.f90. The first column is k=i/Nk2 (i=0, Nk2), we take the second vector defined in KPLANE_BULK as unit of 1. The second line is the summation of the WCC over all the “occupied/2” bands. It’s usefull for telling the Chern number. From the third column to the last column, they are wcc for the occupied/2 bands specified with “NumOccupied”. We can get Z2 topological index (v0, v1v2v3) from the z2 calculations of six time reversal invariant planes, i.e. (a) k1=0.0; (b) k1=0.5; (c) k2=0.0; (d) k2=0.5; (e) k3=0.0; (f) k3=0.5; Usually, you can call “Wannier charge center calculation for a plane” six times. Here we packed them up to get another function. You can set the input file like the following. About the Z2 index for 3D system. For the 2D system, if you set the Z axis as the stack axis, please only take the Z2 number at k3=0 plane. We can get Chern number of six k planes, i.e. k1=0.0; k1=0.5; k2=0.0; k2=0.5; k3=0.0; k3=0.5; where k1, k2, k3 is in fractional units. Usually, you can call “Wannier charge center calculation for a plane” six times. Here we packed them up to get another function. You can set the input file like the following. For the 2D system, if you set the Z axis as the stack axis, please only take the Chern number at k3=0 plane. By applying the uniform magnetic field along one lattice vector, the Landau level spectrum can be calculated by the Peierls substitution. We can calculate the Hofstader butterfly plot by setting Hof_Butt_calc = T. Nslab is the size of the supercell. The corresponding magnetic field strength can be found in the output WT.out. 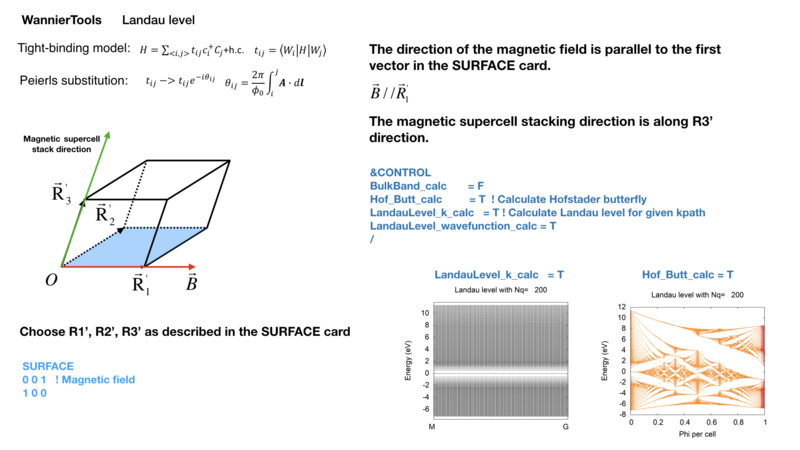 Since the calculation for magnetic supercell is very heavy, we have two versions of eigenvalue solvers. One is direct diagonalization, the other one is the ARPACK solver, which is based on the sparse matrix. So you have to install the ARPACK package, and specify the library in the Makefile. You don’t have to choose the solvers. It is automatically chosen according to the matrix dimensionality. If the dimensionality of the Hamiltonian matrix of the magnetic supercell is larger than 1600, WannierTools will call the sparse matrix solver. Once the sparse matrix solver is chosen. You have to set E_arc and OmegaNum, which means you are going to calculate 2*OmegaNum+1 Landau energy levels around E_arc respect to the Fermi level. The magnetic field is along the first vector specified in the SURFACE card.